As China modernizes and millions of people flock to its mega-cities, leaving behind old traditions and customs, one man is trying to remind them of a centuries-old heritage before it fades into kitschy oblivion. Ma Zhiqiang, executive vice president of the Weifang Folk Artist Association, has been collecting rare Chinese New Year pictures since 1991. He recently published his latest collection (he has six others), Unique Chinese Folk New Year Pictures, a 480-picture database of prints that spans two volumes. "For Chinese people, New Year pictures can be compared to an encyclopedia of Chinese social life," Ma said. "They reflect people's wishes and dreams and their good wishes for the coming year." Many Chinese people hang up New Year pictures, called nianhua in Chinese, to celebrate the lunar New Year, a tradition that dates back to the Song Dynasty (960 – 1279). After flourishing in the Qing Dynasty (1616 – 1912), the tradition began to lose importance after the fall of the last emperor. The Cultural Revolution (1966 – 1976) destroyed many remaining pictures. Now, the custom remains little more than an old-fashioned relic. It still is popular in the countryside, where villagers prepare for the Spring Festival by hanging pictures on walls, doors and windows, but the tradition is all but lost among urbanites. Ma gave several reasons for the tradition's decline. New Year pictures, which are sometimes reproduced in the hundreds of thousands with printing presses, often are seen as the common man's art. In the past, people did not own many works of art, and decorations were expensive luxury items out of reach for most families. "New Year pictures are the only things of art for normal people," Ma said. Now, with rising living standards, people in China have more options with which to furnish their homes, like oil paintings and traditional Chinese paintings. As more Chinese turn to other, more valuable decor, New Year pictures are increasingly regarded as an antiquated convention. Much of the problem lies in their traditional subjects: from deities to beauties, from landscapes and flowers to historical events from China's dynastic era. "Most New Year pictures still describe old stories or outdated mythology," Ma said. "They no longer can reflect today's society and people's lives." One of Ma Zhiqiang's collections. The youth of the new generation have not shown much interest in the pictures. Families that have had generations of craftsmen are suddenly seeing their successors pursuing other more profitable trades. People feel that New Year pictures no longer show any originality or creativity, Ma said. But slowly, that is changing. People in China and around the world are beginning to show a new appreciation for New Year pictures as a legitimate and valuable expression of folk art. Museums in Russia, France, the U.K. and the United States have extensive collections of New Year pictures, as well. Russian museums alone have amassed more than 4,000 pictures, Ma said. 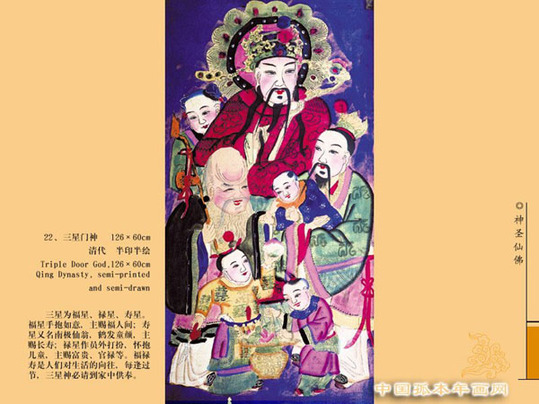 In 2003, Ma helped an 83-year-old master of New Year pictures, Yang Luoshu, receive a UNESCO award for folk arts and crafts. The same year, China listed New Year pictures in its national intangible cultural heritage catalog, an official call for its preservation that has saved tens of thousands of pictures, woodblocks and other carving techniques. Museums and institutes for the art have opened, including one in Yangjiabu, a village in Weifang City famous for its production of New Year pictures. Images are carved into wood blocks, and then color is added to the reproductions. At its height in the golden age of New Year pictures, Yangjiabu craftsmen were making and selling 70 million pictures annually. Now when important officials and celebrities visit the city, they are presented with the New Years pictures as gifts. In fact, Yangjiabu is where Ma, a Shandong native, first started looking for New Year pictures. As a child, he knew of the place, but his family rarely participated in the tradition. 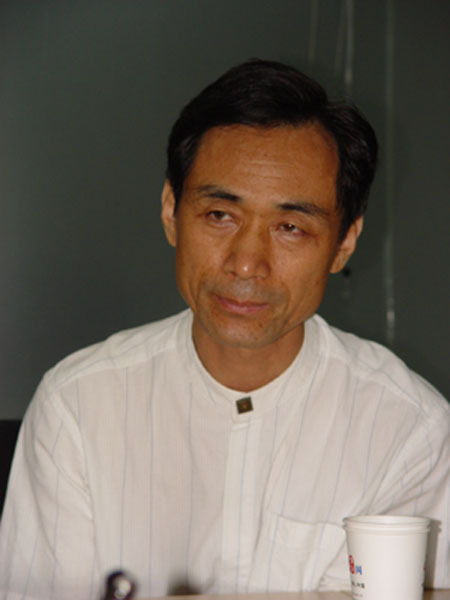 Ma, who has made his career in overseeing Chinese culture, was the deputy director of Weifang's Culture Bureau when he first took notice of Yangjiabu's unique woodblock-printed pictures. Ever since, he has traveled around China to collect old pictures. "I want to show people that we already could print such beautiful paintings in the Qing Dynasty so more people can appreciate them," Ma said. Despite their cultural decline, New Year pictures are still produced in 50 to 70 places around China. Yangjiabu, Tianjin and Suzhou are the three leading producers of New Year pictures. Depending on the difficulty in production, pictures can cost anywhere between one or two yuan for simple prints and thousands of yuan for handmade ones that would take days to make. Ma said it is getting harder to find old pictures for his collection because people know they are rare. He used to have villagers help him hold onto pictures for him when they find them, but now they often keep the pictures for themselves, he said. Ma's interest remains in pre-1950's New Year pictures. Older and rarer pictures are more valuable than today's pictures, which can be found anywhere, Ma said. But because the pictures often were printed on paper, very few exist in good condition and most are torn. Ma has begun to reproduce the famous classics so that they can be passed down to future generations. "Personally, it's just a hobby to collect the pictures," Ma said. "I have only made a little contribution – there are many others who also collect and contribute to preserving New Year pictures. This is just what I ought to do." Michael Jackson has gone, but his music still here. He and his music is a permanent sign of pop-culture.